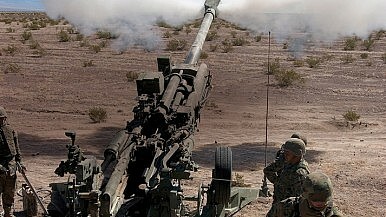 The U.S. government recently approved the sale of 145 lightweight howitzers to the Indian Army. On February 15, the United States submitted a letter of acceptance to India’s Ministry of Defense (MOD) approving the procurement of 145 M777 Ultra Lightweight Howitzers for the Indian Army, The Times of India reports. According to sources within India’s MOD, the Pentagon’s letter of acceptance, submitted under the U.S. foreign military sales (FMS) program, will lead to a government-to-government contract within the next 180 days, should New Delhi accept the offer. The $700 million deal has been in the making since 2008. It suffered from repeated delays and was close to being scrapped until the Indian government under Prime Minister Narendra Modi revived negotiations with the U.S. government and the defense contractor BAE Systems, the producer of the M777 155 mm 39-caliber towed gun, last year. The Pentagon’s offer for the 145 lightweight howitzers–next to outlining delivery schedules, technical, material, and spares support–also includes a 30 percent offset clause under the “Make in India” initiative. This mandatory offset requires that 30 percent (around $210 million) of the contract value needs to be reinvested back into India’s indigenous aviation or defense sector. “While the first lot will be delivered directly, the bulk of the 145 howitzers (manufactured by BAE Systems) will be assembled in India over three years,” according to a MOD source. BAE Systems announced last week that it will partner with the Indian company Mahindra to fulfil the requirements of the “Make in India” clause and offer a higher degree of indigenization on the M777 lightweight howitzers. “As a founding partner of defense manufacturing in India, BAE Systems is pleased to partner with Mahindra on our offer to develop an Assembly, Integration and Test facility in India. The facility is a fundamental part of the M777 production line,” said a representative of BAE Systems. The M777 allegedly is the world’s first 155 millimeter howitzer weighing less than 10,000 pounds (4,218 kilograms). Partly made of titanium, the gun can be airlifted swiftly to high-altitude terrain and is ideally suited for mountain warfare. The M777 has a firing range of up to 25 kilometers. The Indian Army plans to induct the new gun into its new 17 Mountain Strike Corps, which is to be stood up by 2021. The new corps, intended to counter China’s growing capabilities, originally was supposed to have a strength of 90,274 men. However, in April 2015, Indian Defense Minister Manohar Parrikar announced that he would cut the size of the corps by more than half, to 35,000. The Indian military has not been able to procure a new howitzer since 1987, despite the known utility of artillery in mountain warfare as seen in the 1999 Kargil War with Pakistan. As I reported previously, the Indian army’s 1999 Field Artillery Rationalization Plan aimed to acquire 2,800-3,000 155 mm/52-caliber guns of all kinds and 155 mm/39-caliber lightweight howitzers by 2027. The new lightweight guns will be deployed along the China-India border.